and regional distribution of sea level and associated underlying dynamic process in the Southern Ocean. Oh yeah, it’s a very important question to understand the sea level rise because in the past like two or three decades the research community already made very good progress in understanding and project in sea level changes but a significant gap still exists and the decision maker and the end user, they want much better information than what we can deliver right now. The Southern Ocean is one of the few key areas where the heat is up, particularly in the ocean, and secondly warming in the Southern Ocean is critical for the dynamic response of the Antarctic ice sheet. I hope through this project we can achieve better understanding and the projecting of the sea level rise, so this information can be used for better mitigation and habitation planning for sea level rise. Sea level rise is an important climate change research topic. Global mean sea level (GMSL) has been rising according to tide gauge and satellite altimetry observations, and is projected to continue to rise, with a likely range between 0.28 m and 0.98 m by 2100. A larger rise could occur if there is a significantly larger contribution from changes in Antarctic dynamics. Over 100 million people live within a metre of current high tide mark, thus are highly possible to be affected by sea level rise. Several processes can affect GMSL, including ocean thermal expansion, mass loss of glaciers and ice caps, the Antarctic Ice Sheet and the Greenland Ice Sheet, and changes in the land water storage. The Southern Ocean is a key area for improving projections of ocean heat content and sea level change because: it is one of the key areas where heat enters the ocean, resulting in heat storage in the upper ocean and in the abyssal layers, and contributing to ocean thermal expansion; and a warming ocean is critical to the dynamic response of the Antarctic ice sheet. Refine sea level projections based on updated observations and projections of the Antarctica Ice Sheet contribution, together with other sea level contributions. To achieve above objectives, we will use available observations, Climate Model Intercomparison Project (CMIP) models, and an eddy-resolving (1/10o) global ocean model. For the projection of Ice Sheet contribution, we will use either stand-alone or coupled ice sheet modelling from the Ice Sheet Model Intercomparison for CMIP6. Prof Jonathan Gregory from the University of Reading, UK visited CSHOR on 11-15 February. 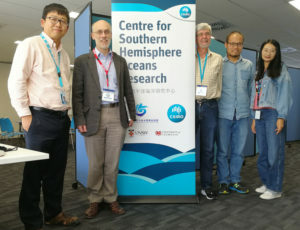 He presented a public seminar titled, ‘Dependence of climate sensitivity to CO2 on patterns of SST variation’ and met with the CSHOR sea level project team to discuss topics of overlapping research interest, i.e., ocean heat uptake and redistribution in the Southern Ocean, ocean/climate sensitivity experiments, and ocean gyre circulation. Dr Gregory and the CSHOR team also identified opportunities for future collaboration. Prof Gregory is a well-known climate scientist, working on mechanisms of global and large-scale change in climate and sea level on multidecadal and longer timescales. 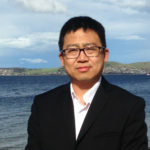 He is one of three recipients of the prestigious BBVA Foundation Frontiers of Knowledge Award in the Climate Change category for their significant contribution to detecting, understanding and projecting anthropogenic sea level rise (https://www.bbva.com/en/frontiers-of-knowledge-award-for-detecting-understanding-and-projecting-anthropogenic-sea-level-rise/). CSHOR © 2017 - 2019. Powered by CSIRO.